OK, I saw this on Friday and have been dying to talk about it, but as so many people still haven't seen it and I don't want to give away spoilers, I've had a number of conversations along the lines of "It's AWESOME!!!! You gotta go see it!!! I loved the bit where . . . ahhh! can't tell you that, but wait till you see what Han and Chewie . . . oh wait, I can't tell you that either . . . oh just go and see the bloody thing, will you!?!?" You will only get this joke once you've seen it, so get a move on, and don't read this thread again until you have!! I will post again in a bit, to give those who haven't seen it a chance to run away . 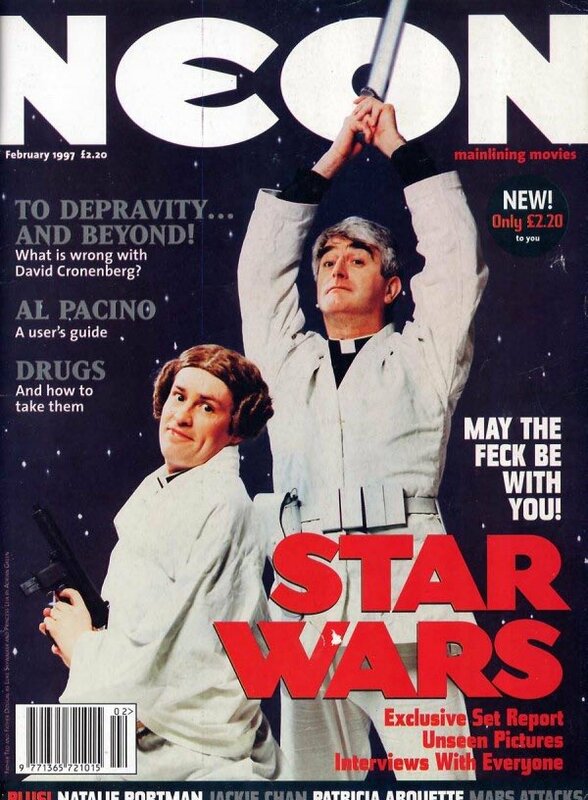 . .
Oh Dear Om, it's frightening how much Ardal O'Hanlon resembles Carrie Fisher! phalarope wrote: Oh Dear Om, it's frightening how much Ardal O'Hanlon resembles Carrie Fisher! The one of Mrs Doyle in the gold bikini definitely causes a disturbance in the Force . . .
not been to see it yet. my brother has and was disappointed. 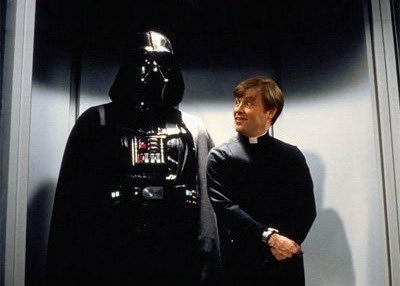 he says it was more or less a remake of episode IV. which i'm inclined to suspect might be accurate as someone at work said the same thing this morning. Bro reckons when hype has died down people will start to judge more soberly and they'll rank only slightly higher than the prequels. It was a good 'leave your reality at the entrance' movie. Some rehashing, or is it homage?, from the early stories. Thankfully no sickly sweet Disney episodes. When the Supreme being appeared I found myself expecting him to say "My Preciousss"! It was only at the end I discovered it was Andy Serkis. I loved when Kylo Ren smashed up his room like a spoilt child when he was angry. I am still wondering with all the technology droids don't have a speech circuit. In the film the phrase "Kessel Run in less than twelve parsecs" gets a second airing. I have read many views that this was a mistake as parsec is a measure of distance not time. However, the statement may not be wrong. When I plan trips I use Google Maps and Garmin. What I get back is a set of routes, fastest, shortest or avoiding tolls or motorways. The fastest is not always the shortest route. The shortest route uses less fuel. Less fuel means more profit. So a journey of 'less than 12 parsecs' would mean more profits. Something a trader would see as important. steeljam wrote: In the film the phrase "Kessel Run in less than twelve parsecs" gets a second airing. Hmm. Did they make Star Wars VII by adding the script of Star Wars 3 to Star Wars 4? Hello. I am one of the good people. I have an electronic file which I need to take to the Good People Base to help them beat the Bad People, but my ship is no longer under my control. I will therefore hide the file in a droid. Hello. I am one of the Bad People. You can tell, because I dress in black and wear a mask indoors. Just so you're clear I'm evil, I torture one of the good people in order to get the file. but I will fail. Hello. I am the best paid actor in this film, with an extensive portfolio of serious film work. I mentored the Bad Guy before he turned bad and still turture myself about it. 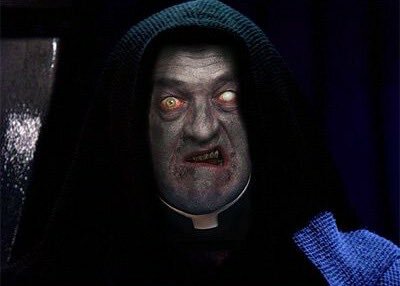 I have lots of other offers of star roles so I will therefore be killed by by me trainee and not play a major role in the next two films. Hi. You don't see me on screen, but I'm the head of Health & Safety for Bad People Head Quarters and my budget has been cut AGAIN. I managed to get a few hand rails in place but nearly as much as we needed. And did NO ONE read my memo "Why Digging A Trench Which Leads To The One Weak Spot Is A Bad Idea"? Hi ya! We're the Comedy Aliens! We just love to hang out in the bar listening to Space Jazz. Enjoy our cameo because we never show up again! So - good fun but not nearly innovative enough for my liking! Finally went to see it. Enjoyable and entertaining. Thought Rey is an excellent character (even if she is bit of a Mary Sue) and I'm hoping for great things from her. Kylo Ren could have been more menacing. He just came across as a sulky teenager. My brother was right though, it is basically a rehash of A New Hope. Hopefully the First Order will realise that super weapons never seem to work well for them. Thought I'd wait till the crowds died down a bit..... I did enjoy it roll on the sequel. I found it a bit boring to be honest. As has been said, a rehash of the original Ep 3+4 with WAY too many wink wink, nod nod fan references (Guys, you are already making Star Wars, you don't need to spend every 5 minutes going 'ooh, let's use that alien/quote/reference/whatever from the original three as a homage to the fans). And it was too long. I was checking my watch after an hour to see how long it was to go- not a great sign. No doubt I'll eventually get around to watching the sequels but I'm not going to bother at the cinema. We finally got to see this! The girls and I loved it. Derek did not. I enjoyed all of the nods to the previous movies, but acknowledge the story line was a bit of a rehash. Still enjoyed the story and the characters though. Only two complaints. As Stu said, they could have done better with Kylo Ren. I think they missed the mark there. And, I was DEVASTATED when Han Solo died! Why?! Looking forward to seeing more though.